Global Economy Matters: As Hungary's "Correction" Heads For A Dead End, Time For A Change Of Course? As Hungary's "Correction" Heads For A Dead End, Time For A Change Of Course? Hungary's economic correction still fails to convince. Indeed I am not the only one who remains unconvined by the viability of what is currently taking place it seems, since according to the opposition supporting local daily newspaper Magyar Hírlap, none other than the Hungarian Prime Minister himself may be having doubts, as he is reportedly thinking of leaving the helm of the struggling ship placed under his charge before the next general election, which is scheduled to take place sometime early next year. If this version of events is ultimately confirmed it will only add to the IMFs growing problems out East, since events in Latvia are not going at all according to their liking - see FT Alphaville's Izabella Kaminska's "Another Latvian wobble" of last Friday - and indeed Latvia’s government rapidly cobbled together another 275 million lati ($575.6 million) in spending cuts for 2010 yesterday after EU Economic and Monetary Affairs Commissioner Joaquin Almunia called on Latvia on Friday to “renew a national consensus”, and Prime Minister Valdis Dombrovskis paid a flying vist to Brussels, following a parliamentary vote against sending a real-estate tax bill through to the committee stage, implicitly rejecting part of an agreement with the IMF and EU. How many times this year does that now make it that the national consensus has had to be urgently renewed under directives from either Washington or Brussels, could someone please remind me? Further, Hungary's main opposition party - Fidesz - which looks well-positioned to win next year's general elections, are threatening to rewrite the current ever-so-carefully written 2010 budget when they comes to powe next year, according to the latest statements from party president Viktor Orban. "This (the IMF text, EH) is the most dangerous budget of the past 20 years ... never before has a budget put hundreds of. thousands, or even millions of Hungarian families at such grave risk," Orban told private broadcaster Hir TV in an interview late on Friday. "This budget will not remain in place, we will draw up another one instead," said Orban, a former prime minister, adding that if in power, his government would create one million new jobs in 10 years. Well, things certainly do not look good either for Gordon Bajnai or for the EU Commission/IMF team who are behind the budget. Perhaps that is why the IMF's representative in Hungary, Iryna Ivaschenko, told national news agency MTI yesterday that while the government was committed to its 2010 fiscal targets, there were economic and implementation risks on the nature of which she declined to elaborate. Clearly the above mentioned report about the PMs intentions does come from a rather biased source, but it is interesting to note that credibility is being given to it by normally more impartial sources like Portfolio Hungary, and as they themselves point out there has been no outright denial of the suggestion from government sources. Perhaps even more astonishing was the statement by the Hungarian Finance Minister Peter Oszko to Dow Jones Newswire on Friday that the most difficult reforms to address economic imbalances have now been completed. "I believe the most difficult part of our job is done - our package creates not only short-term but mid- and long-term fiscal balances" he said. I say astonishing, since as far as I personally can see (take a look for yourself at the charts below) the changes that are needed haven't even begun yet. The whole emphasis have been on cutting the deficit, with little serious thought being given about how the Hungarian economy can get back to growth - which is the only real way the fiscal balances can become stable - all that seems to have happened is a 5% VAT hike to squeeze domestic consumption even further, and some compensatory tax changes on the other side to stimulate employment, but the real economic imbalances have been left untouched. A supply side micro-economists paradise, whisper the words "long term steady state growth" to yourself three times, cross your fingers, and hope for the best. However, the underlying mirky political realities may soon burst their way into the parlour room, to disrupt this happiest of happy families. Indeed everything may well now hinge on getting the budget through parliament and then disrcetely leaving by the side entrance, since Magyar Hirlap suggest that the Hungarian Parliament may well be dissolved directly after the vote on the 2010 budget - which is currently scheduled for 30 November. Apparently everyone's calculations have been thrown awry by the early re-election of José Barroso, and the imminent reappointment of the EU Commission. Plenty of food for thought here. The paper also suggests that Prime Minister Gordon Bajnai now totally accepts that the forthcoming electtions are inevitably lost - the only bit of realism I can see in all this - and as a consequence seeks to have them advanced to February from the currently probable date of April or May. In this way Bajnai would be able to offer himself to replace the present Hungarian representative László Kovács, who is currently Commissioner for Taxation and the Customs Union. Bajnai, it will be remembered, has only been Prime Minister since last April, but then, with these sort of techniques it doesn't take that long to put a country straight, now does it? Advancing elections in a situation where the present budget proposals are massively unpopular may make perfect sense according to a certain democratic political logic, but the economics lying behind the idea must be making people in Washington and Brussels throw up their arms in despair. More evidence to back the idea that the current programme is not working came in the latest report released by the committee which monitors the long term legalisation of Hungary's underground economy. The process is not only not advancing - it has been thrown into reverse gear, it seems. According to Committee president, and Central Statistical Office analyst, Csák Ligeti some HUF 100 billion (EUR 369.17 million) in tax revenues were lost in the first half of the year due to a ressurgence in the growth of the black economy. In his report he noted, by way of contrast, that during the previous two years the state budget had received around HUF 200-250 billion (EUR 738.1-922.6 million) in extra revenue due to the "whitening" process initiated in the autumn of 2006 as part of a programme to correct the large fiscal deficits the country was running. 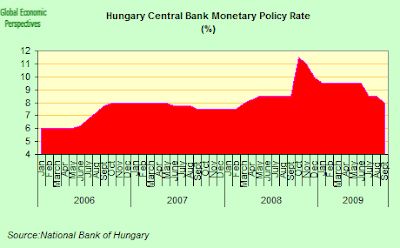 On another front, the IMF warned last week that while Hungary's banking sector had so far weathered the crisis reasonably well - thanks to the multilateral rescue programme - and now has sufficient capital buffers, asset quality still looks set to deteriorate steadily due to weakness in the domestic economy, and especially rising unemployment. This, of course, is another good reason why they should have been including a rapid return to export lead growth in the correction strategy, since obviously if you simply sit back and wait to see what happens, there will be no big surprise - the percentage of Non Performing Loans will just go up and up. "Developments in the banking sector have been positive; so far so good, and in line with one of the main objectives of the (IMF) program to preserve financial stability," Iryna Ivaschenko, the IMF's resident representative in Hungary, told Down Jones in an interview on Thursday. However she immediately added that the IMF projects the amount of non-performing loans, which stood at a "still moderate" 4.8% of overall loans at the end of June, "will peak and at least double in the first quarter of 2010,". This IMF warning follows a Standard and Poor's one at the end of August. The financial profile of Hungarian banks is set to weaken over the near term as a result of the country's ongoing recession, the weak and volatile national currency, and pressure on funding, according to the S&P report. The report, which was entitled "Banking Industry Country Risk Assessment: Hungary", followed the recent decision by Standard & Poor's to revise its ranking of the Hungarian banking system to reflect increased economic risks in the country (BBB-/Negative/A-3) and structural weaknesses in the country's economy and banking industry. "Hungary's significant external financing needs, which stem from high public-sector leverage and large external imbalances, represent a structural weakness that exposes the economy to the tight and expensive funding conditions in global markets," according to Standard & Poor's credit analyst Harm Semder, who wrote the report. The report argues that nonperforming loans and depressed recovery rates are likely to cause a material rise in credit losses, which will in turn subdue bank profits and capital through 2011.
Credit risk is heightened by the rapid growth of unseasoned loans - particularly commercial real estate mortgages - over the past five years and a significant increase in loans denominated in foreign currency that lack the foreign currency revenues to service them. The report estimates that cumulative gross problematic assets, which include restructured loans and repossessed collateral, could increase to 25%-40% of total loans during the course of the current domestic recession. It further suggests that the eventual recovery will be slow. The entire situation in Hungary vis-a-vis wages, employment and inflation continues to be preoccupying. The country is in the midst of a huge correction, and depends on improving exports in order to attain economic growth. Yet the correction is not proceeding as planned. Inflation - at an annual rate of 5% in August, is far too high in contrast to benchmark German inflation which remained negative in August (minus 0.1% ) to be recovering competitiveness. Real wages have continued to rise, and only sneaked into negative territory for the first time in over six months in July - with a 1.1% drop in the benchmark ex-bonus hourly rate in the private sector. Total employment is falling slowly, but even this process masques an important shift towards public sector employment, as the number of public employees has risen substantially in recent months while the number of employees in the private sector has continued to fall - exactly the opposite of what was meant to be happening. Meanwhile the country continues to get ever deeper in debt thanks to the relatively generous financing conditions offered by the EU and the IMF. The point is where does this all end? Where is the correction here? The National Bank of Hungary is struggling to find an adequate monetary response. The bank lowered its benchmark interest rate by 50 bp to 8% last week, but this still represents a real interest rate of around 3%. The move followed a surprise 100-bp rate cut at the end of July. While a month ago, the market was expecting 50 bp easing, this time there was no real surprise. As for the future, the National Bank of Hungary release uses standard central bankspeak that intentionally remains ambiguos and guarantees the Bank Council is not committed in any particular direction. As long as there is no change in the international environment over the coming months, the the Council will be most likely having to decide whether to cut a further 50 bp or more. So while the bank has evidently eased policy considerably, monetary conditions are evidently still far too tight to stimulate dynamic activity in the private sector, which is almost literally wilting on the vine at the present time. Meanwhile, in a further sign that the recession is settling in for the long haul, Hungarian retail sales extended their decline to 29 months in June as IMF/government measures to narrow the budget deficit continued to sap consumer spending. True Love In The Eternal Embrace? Well, despite the fact that many may think the expression "eternal triangle" in the present context refers to the Hungarian government, the EU Commission and the IMF, they would be wrong since one convenient way of thinking about what just happened in Hungary could be to use another kind of eternal triangle the one developed in Nobel Economist Paul Krugman’s model of the same name, which postulates that when it comes to tensions within the strategic trio formed by exchange rate policy, monetary policy, and international liquidity flows, maintaining control over any one implies a loss of control in one of the other two. In the case of the Central Europe “four”, Poland and the Czech Republic opted for maintaining their grip on monetary policy, thus accepting the need for their currency to “freefloat” and move according to the ebbs and flows of market sentiment. As it turns out this decision has served them remarkably well, since the real appreciation in their currencies which accompanied the good times helped take some of the sting out of inflation, while their ability to rapidly reduce interest rates into the downturn has lead to currency depreciation, helping to sustain exports and avoid deflation related issues. A second problem which stems from this “initial decision” has been the tendency for households in the latter two countries to overload themselves with unhedged forex loans, a move which stems to some considerable extent from the currency decision, since in order to stabilise the currency, the central banks have had to maintain higher than desireable interest rates, which only reinforced the attractiveness of borrowing in forex, which in turn produced lock-in at the central bank, since it can no longer afford to let the currency slide due to the balance sheet impact on households. Significantly the forex borrowing problem is much less in Poland than it is in Hungary or Romania, and in the Czech Republic it is nearly non-existent. So, if we look at the current state of economic play in the four countries, we find two of them (Hungary and Romania) undergoing very severe economic contractions - to such a degree that in both cases the IMF has had to be called in. At the same time both of them are still having to “grin and bear” higher than desireable inflation and interest rates. In the other two countries the contraction is milder, the financial instability less dramatic, and both inflation and domestic interest rates are much lower. Really, looked at in this light, I think there can be little doubt who made the best decision. While wages and prices more or less steadily wend there way upwards, we have no hurry hear, you understand, GDP has been in freefall. Year on year it was down an annual 7.5% in Q2 (and a seasonally adjusted 2% from the first quarter) . The Hungarian government currently expects the economy to contract 6.7 percent this year, in the largest drop in outout since 1991. My view is that we have a total policy trap in operation here, since neither monetary or fiscal policy are available to an adequate degree (even after today's change interest rates are still at 8%), and there is thus little support available to put under the economy at this point. The only way to break the circle in my opinion is to violently kick start exports by letting the forint drop, bringing down interest rates, and restructuring all those CHF loans. If, instead of browsing over all those diplomatic statements we look at what is going on on the ground, then we find that private sector employment is now well down, by 9.2% y-o-y in July. While in the same month industrial output was down 19.4% over a year earlier. Something just doesn't seem to be working as it should be here. Not surprisingly given the strength of the contraction total employment fell back again, for the second consecutive month, in July, and stood at was 2.657 million. There were 1.803 million in the private sector and 765 thousand in the public sector. Total employment was thus down 4.4% over July 2008. Private sector employment is well down in Hungary, by 9.2% y-o-y in July. On the other hand, public sector employment has been chugging away on the up and up, due to job creation under the short term stimulus programme, courtesy indirectly of the IMF, who have permitted a larger than anticipated budget deficit. But don't get me wrong, it's not the stimulus I am quibbling about here, it is what it is being used for, and the absence of a realistic plan. It's easy enough to run up debt, especially when the EU Commission and the IMF guarantee you, but its a lot harder to pay it down again later, and Hungarian debt to GDP now looks set to go through the 80% of GDP level in 2010. So, the outcomes we are seeing simply don't seem to me to be producing a large enough structural change in the right direction. On the other hand, even this public sector employment boost now seems to have started to turn, since even public sector employment fell back on the month in July - for the first time in six months - although it was still up 5.6% year on year. 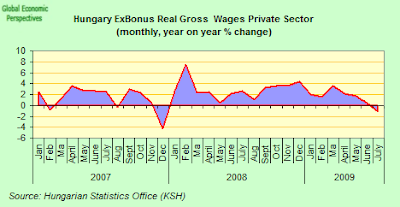 Hungary's gross average ex bonus private sector real wages entered negative territory in June, for the fisrt time in over six months, and fell at annual rate of minus 1.1 percent. Real public sector wages continue to fall sharply, and contracted by an annual 11 percent year-on-year in July following a 13.4 percent contraction in June - although some of the volatility here is the result of a changed system of payment for the additional (13th) month's salary. What is happening in Hungary is really an obvious example of "sticky wages" if ever there was one as far as I can see, since employment in the private sector is falling, and unemployment rising, so you would expect the opposite effect to operate, and real wages to be falling sharply at this point. According to Erika Molnarfi of the stats office, the upward drift in average private sector salaries is the outcome of a sharp decline in production workers which was not accompanied by a decline in administrative workers, exactly the opposite result to that you want to see. Far from the current recession leading to a significant downward shift in wages and prices, real wages had been rising continuously until July, while Hungary's consumer prices were still running year on year at 5% in August - up from 3.7% in June due to the VAT effect, and still far to high to start restoring competitiveness. . 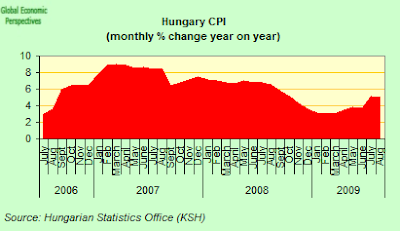 If the current trend continues, and the HUF remains in the region of its current euro parity, then Hungary's agony looks set to continue unabated well into 2010. 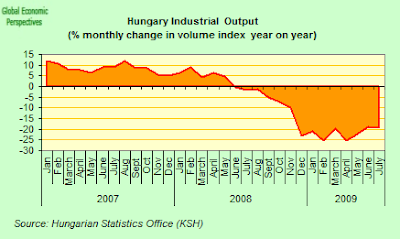 And Hungarian manufacturing output fell back again in July, and industrial output decreased by 19.4% compared to July 2008. The volume of production was 22.1% lower over the first seven months of 2009 than in the same period of the previous year. The volume of industrial production fell back in July by 0,7% on June according to seasonally and working-day adjusted indices. Industrial export sales declined by 25.2% in the first seven months of 2009 and by 19.8% in July compared to the same period of the previous year, as a result of a sharp fall in external demand. So Hungary is suffering from a generalised drop in demand - domestic, export, government, and investment - for which it is difficult to see any short term remedy. Investments fell in the second quarter of 2009 by 4.7% compared to the same period of 2008. In the first half of 2009 investments in the national economy were 6% down over the corresponding period of the previous year. Investments did however increased by 0.4% quarter on quarter, but when we break this down we find that of the 4.7%annual drop in investments in the second quarter those in machinery and equipment fell by 11.6%, while the volume of construction investments – due to investments in dwellings and motorway constructions – grew by 1.1% compared to the same period of 2008. But when we look at the construction data we find that the improvement in construction is all about civil engineering, so any increase in machinery and equipment investment is still some way off at this point. Evidently the first sign of any real recovery in the Hungarian economy will come when machinery and equipments investments stabilise and even start to increase, since that will be a reflection of the expectation of future demand arriving further down the pipeline, and will be a measure of real employment creating possibilities. But things don't look set to improve soon, since Hungary's purchasing manager index dropped by 3.4 points to 45.8 points in August, according to the most recent report from the Hungarian Association of Logistics, Purchasing and Inventory Management (HALPIM). 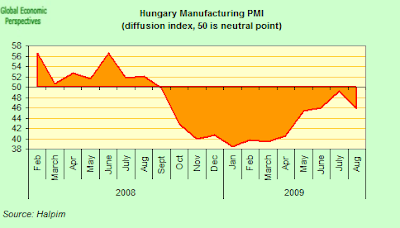 The latest data is highly disappointing not only because Hungarian manufacturing has now been contracting for 11 straight months, but because the August eurozone PMI index showed a larger-than-expected pickup. This thus suggests that Hungary is being left behind in the scramble. Hungary recorded its fifth monthly trade surplus in June, coming in at 457,3 million euros slightly below the 490.1 million euros acheived in May but well above the 30.8 million euros of June last year. Now good news is always good news, but it is important to understand that this result was almost entirely achieved via a dramatic drop in imports, which plunged an annual 30.4 percent in June (following a 32.3 percent decline in May). It is impossible to talk of any marked improvement in exports, since these fell by an annual 21.1 percent, decelerating from the 24.1 percent drop in May, but still very large. While in the short term this substantial drop in imports (and hence rise in the trade balance) is GDP positive, it is very negative for living standards in the longer term, and the whole situation needs to be reversed by a large boost in exports leading imports as the eurozone economy eventually recovers. But to be able to achieve this Hungarian industry needs to do more, much more, to achieve competitiveness. Over the January-June period, the volume of exports and imports fell by 20 and 25 percent, respectively, compared to the same period of the preceding year. The trade balance showed a surplus of HUF 606 billion (EUR 2,055 million), which meant an improvement of HUF 534 billion (EUR 1,766 million) compared to the surplus of HUF 72 billion (EUR 288 million) in January-June 2008. 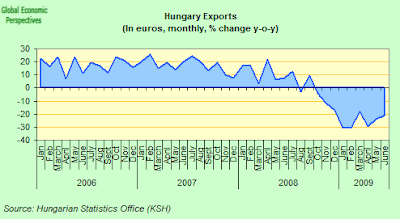 In January-June 2009, the forint price level of exports and imports both increased by 6 percent, respectively, The forint exchange rate had however weakened by 17 percent with repsect to a basket of leading foreign currencies, and within this by 14 percent to Euro and by more than 30 percent to the dollar. So, if getting the growth needed to drive GDP is the objective, and this is any evidence, then there is still a long long way for the forint to fall. Over January-June 2009, the export and import volumes of machinery and transport equipment, which constitute 60 percent of exports and nearly 50 percent of imports, fell by and above average 24 percent in the case of exports, and by 27 percent in the case of imports. Construction activity was down by 5.1% in July as compared to July 2008. In the first seven months of 2009, output was down by 2.4%. In comparison June, production fell by 12.2% in July according to indices adjusted for seasonality and working days. This large drop is really only a reflect of the pre VAT introduction surge registered in June. The two construction sectors are moving in opposite directions at the moment. Within the 5.1% aggregate increase, building construction was down by almost a quarter, while civil engineering works expanded by 19.6%. From the start of the year the construction of new buildings is down by 12.7% while civil engineering works are up by 12.3%. From the September 2006 peak construction activity as a whole is now down by 27.58%. September 2009 will mark the start of the third year of contraction. 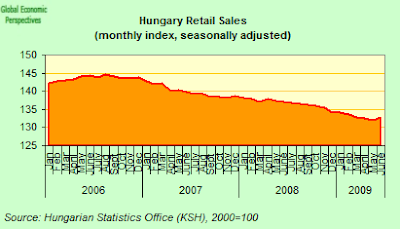 Hungary's retail sales fell by 2.2% in June compared to June 2008, although sales did increase by 0.5% compared to the previous month. Of course, we need to remember in this case that the 5% VAT hike was introduced on 1 July, so it is perhaps surprising that the increase wasn't bigger. Thus the month on month increase is very misleading, since it was evidently driven by the government decision to raise value-added tax on the first of July - in an attempt to compensate for revenue losses which will be produced by forthcoming reductions in personal income and payroll taxes . So the increase in sales was in fact due to an attempt to avoid the 5% rise in VAT, and we should be ready for a sharp drop in July. Prime Minister Gordon Bajnai is in the process of implementing spending cuts worth 1.3 trillion forint ($6.9 billion) over a period two years in an attempt to keep the budget deficit in check. Hungary’s central bank cut its benchmark interest rate to the lowest level in 17 months at the end of August to try to help jolt the countryt out of its worst recession in almost two decades. The Magyar Nemzeti Bank lowered the two-week deposit rate to 8 percent from 8.5 percent. Monetary policy makers voted for the 50 basis-point cut with an “overwhelming” majority over a reduction to 7.75 percent according to central bank President Andras Simor. In fact the minutesd showed that the bank cut interest rates by a seven to one majority, with one member voting for a 75 base point cut. In fact many analysts now see further easing in the pipline, but in taking this stance they need to think about two points. i) The Hungarian government is still incredibly complacent about the inflation problem, and currently forecasts that inflation will only slow by the end of next year to something just below the central bank's current medium-term target which is itself very complacent. "We expect inflation to slow from [an annual average of] 4.5% this year to 4.1% in 2010. As for 2010, the December inflation figure may start with a digit 2," Finance Ministry State Secretary Tamas Katona told journalists last week. In its latest report on inflation, published in August, the National Bank of Hungary projected that inflation will likely dip below the 3% mark from the third quarter of 2010 onward. The central bank's annual inflation forecast is 2.5% on average for the second half of next year. But if Hungary wants to avoid a substantial devaluation then the internal devaluation needs to operate, and to a significant degree, which makes these current forecasts simply laughable. You wouldn't have thought, given all the complacency that the economy was contracting at around an annual 7% rate. ii) the key problem for the central bank is the value of the forint - given the level of household exposure to Forex loans. My opinion is that the recent recovery in the currency value has been almost entirely driven by yield differentials, and by self-fulfilling expectations (traders expect the currency to rise), rather than by any change in the underlying economic fundamentals, which as we have seen, has not taken place. But with consumption sinking, government spending falling and exports insufficiently competitive to drive the necessary surplus, the whole thing is now becoming rather a mess, with no clear economic policy objective in the short term (except, of course, cutting the bfiscal deficit and maintaining a strong exchange rate), while in the long term the emphasis is rightly on increasing exports. But no one has any idea of how exactly to correct prices sufficiently with the CHF mortgages stuck in the middle, and it remains to be seen how the markets will ultimately respond to these rate reductions as and when the wind of risk sentiment changes, as it will. Basically the problem is the value of the forint. 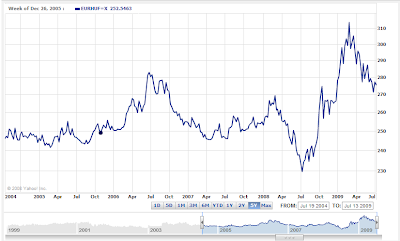 My opinion is that the recent recovery in the currency value (see chart below) has been almost entirely driven by yield differentials, and by self-fulfilling expectations (traders expect the currency to rise), rather than by any change in the underlying economic fundamentals, which as we have seen, has not taken place. 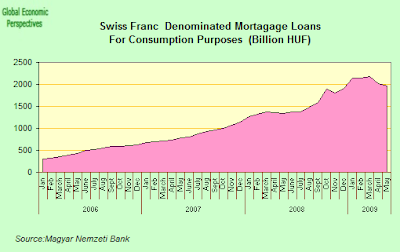 The problem the central bank and the Finance Ministry have to address is the ongoing issue of the mountain of Swiss Franc denominated mortgages. These have stopped increasing in recent times, but still constitute a serious obstacle to any devaluation of the HUF, due to the non performing loans issue this would create for the banking sector. Not only has money been borrowed against homes for to fund house purchases, it has also been loaned for consumption, so indeed the fact that even these loans are stagnating hardly bodes well in any way for domestic demand. 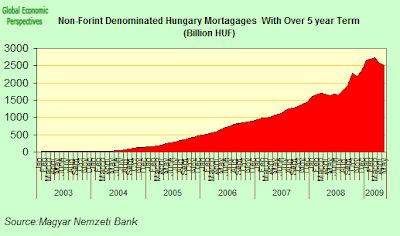 The result of all this botched policy is that Hungary’s EU harmonised unemployment rate rose to the its highest level in at least a decade in May and has been stick there ever since - and with the rise of unemployment, of course the percentage of impaired loans in the banking sector will also continue to grow. The rate rose to a seasonally adjusted 10.3 percent, the highest since at least 1996 and was still there in July (the latest month for which we have Eurostat data). And the situation is more likely to deteriorate than improve, with the central bank forecasting lay-offs of around 180,000 across 2009-2010, nearly 5% of the total number of employed, and now even the number of employees in the public sector is starting to fall back.